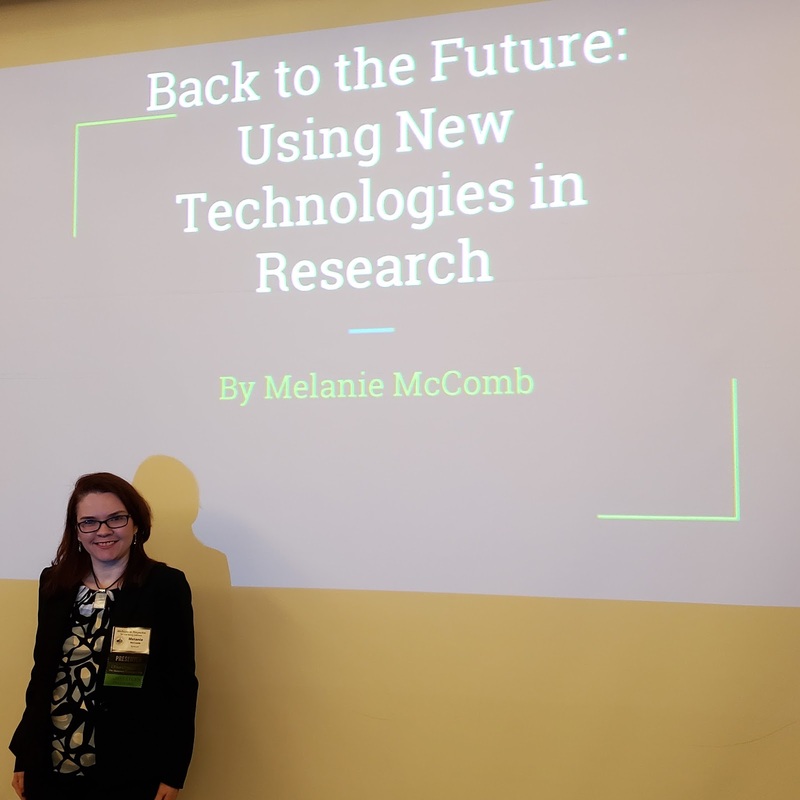 This past weekend I had the honor to be selected as a presenter for the Michigan In Perspective: Local History Conference in Sterling Heights, Michigan. I'm just starting to lecture and was happy for the opportunity to talk about genealogy. My topic was "Back to the Future: Using New Technologies in Research". I discussed social media, blogging, and mobile applications and how to apply that to your family history research. I shared some stories from my family including great grandfather Thomas Corcoran (who I previously blogged about - see my earlier post). The audience loved the story I shared about my great grandfather's first love. I felt that my talk made an impact - one couple came up to me and said they visited a cemetery after my talk! And they used the Find a Grave app that I discussed! This conference was very different than genealogy conferences I've been to. First, there are no major companies like Ancestry, FamilySearch, MyHeritage, etc. in attendance. The vendors were local to Michigan, specifically in the Detroit area. I did spot the Dearborn Genealogical Society booth and talked with a few staff members. I left with a few fact sheets and maps that will be very helpful. I also stopped by the DigMichNews booth. They asked for a shout out in my presentation and I gladly gave them a plug while discussing OldNewsUSA mobile app. Other vendors included several book publishers, some military museums with artifacts on display, and other museums and non-profits native to Michigan. Another main difference was the scope of speakers. I was the only genealogist (at least as listed on the program). Most presenters were authors or ran museums. There was such a variety of talks though. One gentleman, Joe Grimm, wrote a book called Coney Detroit where he talked about the history of the Coney franchise. Everyone left so hungry and I thought that I wasn't going to have time to get a Coney. I met a lovely couple at the bar one evening and we bonded over the course of the conference. They took me for my first Coney before I took off heading back home. Other talks focused on Detroit history. It was nice to be around others that had a strong fascination for history - there were even women dressed up as suffragettes for their talk. One presentation was a true bonding experience. We all shared (quickly) what we did and what we're working on and started networking. What a great idea and something I hope to see at other conferences! I encourage my genealogy readers to check out a local history conference to see what's out there. There's lots of gems out there and you may make a new friend along the way.